We report results from the application of an integrated assessment model, MiniCAM 1.0. 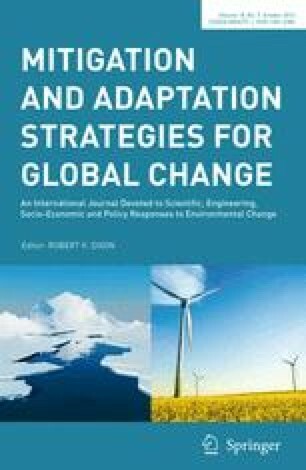 The model is employed to explore the full range of climate change implications of the successful development of cost effective, advanced, energy technologies. These technologies are shown to have a profound effect on the future magnitude and rate of anthropogenic climate change. We find that the introduction of assumptions developed by a group of ‘bottom-up’ modelers for the LEESS scenarios into a ‘top-down’ model, the Edmonds-Reilly-Barns Model, leads to ‘top down’ emissions trajectories similar to those of the LEESS. The cumulative effect of advanced energy technologies is to reduce annual emissions from fossil fuel use to levels which stabilize atmospheric concentrations below 550 ppmv. While all energy technologies play roles, the introduction of advanced biomass energy production technology is particularly important. The consideration of all greenhouse related anthropogenic emissions, and in particular sulfur dioxide, is found to be important. We find that the consideration of sulfur dioxide emissions coupled to rapid reductions in carbon dioxide emissions leads to higher global mean temperatures prior to 2050 than in the reference case. This result is due to the short-term cooling impact of sulfate aerosols, which dominates the long-term warming impact of CO2 and CH4 in the years prior to 2050. We also show that damage calculations which use only mean global temperature and income may be underestimating damages by up to a factor of five. Disaggregating income reduces this to a factor of two, still a major error. Finally, the role of the discount rate is shown to be extraordinarily important to technology preference.